﻿World Oceans Day: Calendar, History, Tweets, Facts, Quotes & Activities. World Oceans Day serves as a celebration of our oceans, which generate most of the oxygen that we breathe, feed us and regulate the planet's climate. The day also serves to promote the oceans' contribution life and the need to protect it from harmful pollution, overexploitation, destructive fishing and climate change. Unfortunately, as a result of human pollution and exploitation, the world's oceans are becoming increasingly delicate. In 1992, the Government of Canada proposed World Oceans Day at the Earth Summit in Rio de Janeiro. By 2002, the Ocean Project, a non-profit organization dedicated to conservation of the planet's oceans, began to promote and coordinate the event on a global scale. Finally, in December of 2008, the United Nations General Assembly officially proclaimed June 8th as World Oceans Day. The Earth is covered by water on 71% of its surface, 96.5% of that water is in the oceans. The theme for World Oceans Day in 2017 is Our Ocean, Our Future. It is estimated that 50-80% of all life forms on Earth is found under the oceans' surfaces. Oceans consist of 99% of all living space on the planet. If all of the Earth's ice melted, the oceans would rise 66m and flood all low-lying ground. The lowest point on the plantet is located in Mariana's Trench in the western Pacific. The point, known as Challenger Deep, is 11,034m deep. (Mt. Everest is only 8,848m tall). If you live near an ocean, spend time swimming in the water, sailing, surfing or just walking along the beach. If you don't live near an ocean, plan a trip to enjoy ocean. Join the Wear Blue, Tell Two campaign. Wear blue clothes and share two ocean facts with friends. Get your scuba diving license. Every city offers scuba lessons to prepare you see the underwater world. PADI and SDI are two well-known and reputable companies that offer certification courses. You cannot scuba dive without certification. Host a waterside cleanup or adopt a local waterside and do your part to help the oceans and its wildlife. 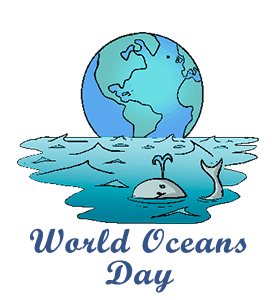 World Oceans Day website offers a tool kit to help set up these activities.